Corporate Actions and Income processing has long been recognised as the riskiest part of the post trade process. Many, if not all firms within the industry have suffered significant financial losses relating to this operational process. Historically, there has never been a commercially available system or framework within which the monetary value of the operational risk associated with this process can be measured. To address this Ibacas has used its extensive Asset Services specialist knowledge and worked with leading financial institutions to develop the Corporate Actions Risk Measurement Application – Carma. Carma allows firms to run real-time analytics of their Corporate Actions processing portfolio and produce detailed analysis of the monetary value of the associated risk exposure, from an enterprise level down to an individual account position. Where is the risk associated with Corporate Actions processing? 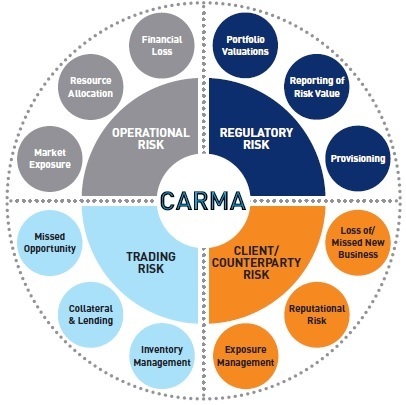 In addition to the Operational Risk that can result in financial loss, Carma also takes into account the risks associated with Optimisation of Trading Strategy, Client/Counterparty Risk and Regulatory Risk.